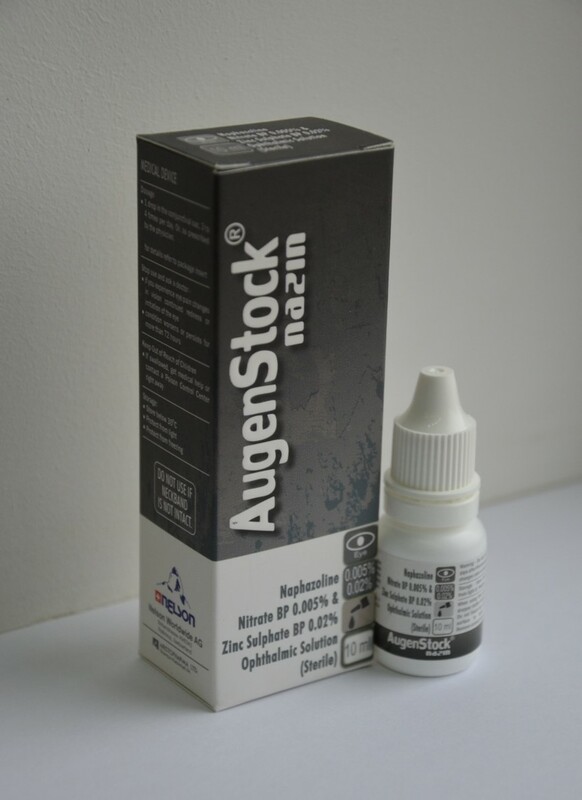 Augenstock Nazin Sterile Eye Drops: Each ml contains Naphazoline nitrate 0.05 mg and Zinc sulphate 0.2 mg. Acute and chronic non-infectious conjunctivitis, nonspecific conjunctival irritation; also after successful treatment of bacterial and viral conjunctivitis. Irrigation of the tear ducts. Zinc ions, the active compound of zinc sulphate, have an astringent, i.e. tissue-sealing and slightly anti-septic effect. Naphazoline constricts the blood vessels and reduces the inflammation and swelling of the conjunctiva. This effect of naphazoline, a substance of the benzylimidazoline group, is due to direct binding to a-adrenergic receptor sites on unstriated muscle cells in the blood vessels. Adults: 1 drop in the conjunctival sac, three to 4 times per day.Children: Generally, in children the dosage of vasoconstrictors should be low and selected with caution.